Recovering Working Mom: Camp Runamuk . . . I had an Epiphany . . .
Camp Runamuk . . . 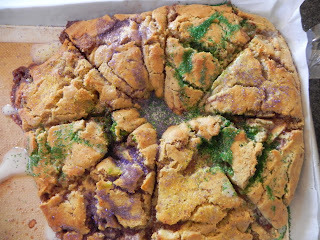 I had an Epiphany . . .
. . . about how to celebrate every holiday between Ephiphany and Mardi Gras all in one day and one meal. The kids had the day off from school, so we all know what that means . . . Camp Runamuk. 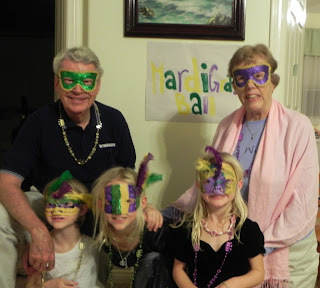 On Friday my type A brain decided we needed to celebrate Ephiphany (that actually takes place on January 6th), Chinese New Year (January 22nd – February 6th), Valentines Day and Mardi Gras. I know, I’m smoking crack! b. invite Grandma and Grandpa over for that part of the day. Holy sh*t those things are complicated and they make the biggest mess known to man! 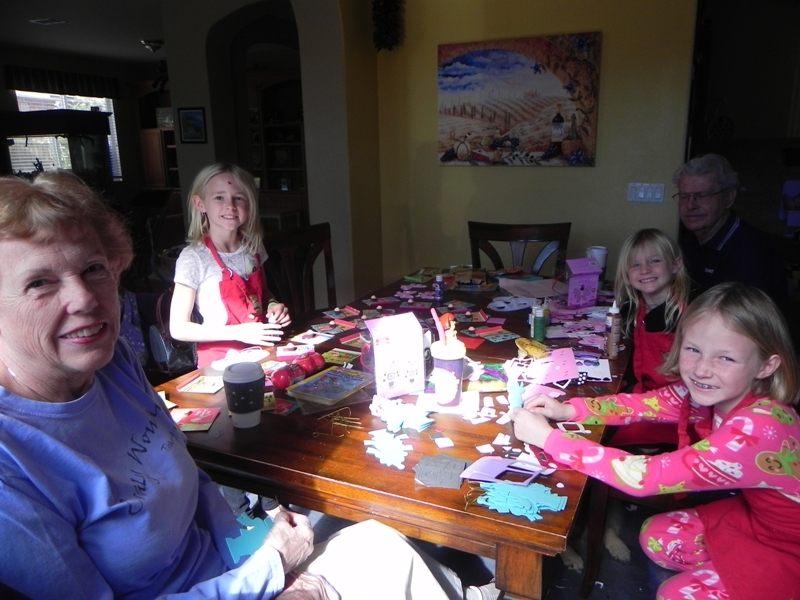 Thankfully, Grandma patiently helped make 24 valentine robots with the Ego and Grandpa wrote the names of all 26 of The Id’s kindergarten friends. They did all this while mommy pretended to be busy making a Gluten Free Mardi Gras/Ephiphany King Cake. 2) When making an Epiphany King Cake, DO NOT decide that you HAVE to include a plastic baby Jesus in the cake (apparently it can be any type of fun trinket, it doesn’t have to be Baby Jesus). Of course, if you only attend church once a month, this would be something you could easily miss! I couldn't find a plastic baby to put in the cake, so I had the brilliant idea to make one of dough. 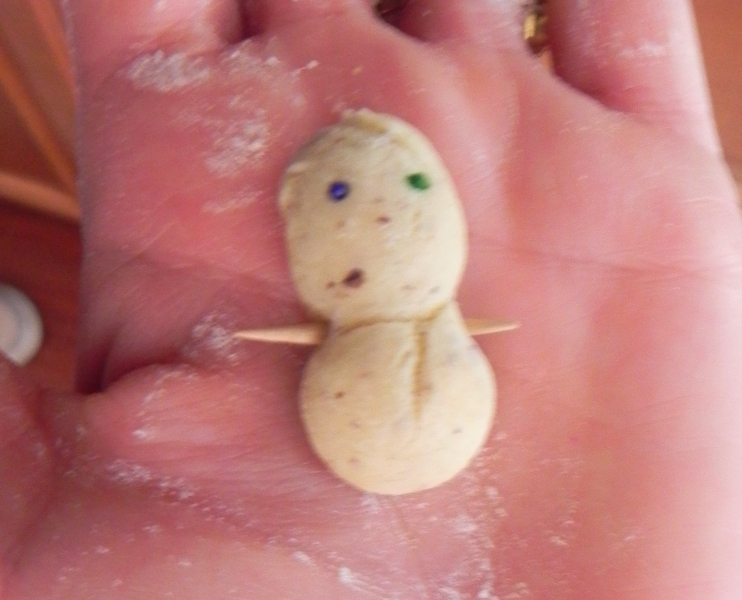 I will say, a plastic baby Jesus would have had nothing on my “half-baked” baby Jesus! Word of caution though, if you employ this strategy, remember where you put the baby in the cake, and DO NOT use toothpicks for arms. This could be a hazard to small children. Thankfully, when we saw that The Id ended up with the baby’s head and grandma with the body, we knew grandma could find the toothpicks! Yes, we decapitated the baby and I'm probably going to hell now! I know I’m a dumb@$&! But, an entertaining one at least! Mine definitely did not look like the one on the Jules Blog. 3) If you leave your children unattended with Grandma and Grandpa you MAY come home to a glowing report as to how great they were, and then you’ll see why . 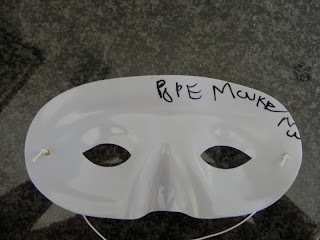 . . when you go upstairs you’ll see that the children have transformed your loft into the Mardi Gras ballroom with decorations hanging from the ceiling and the rugs from the children’s rooms laid out as the dance floor! 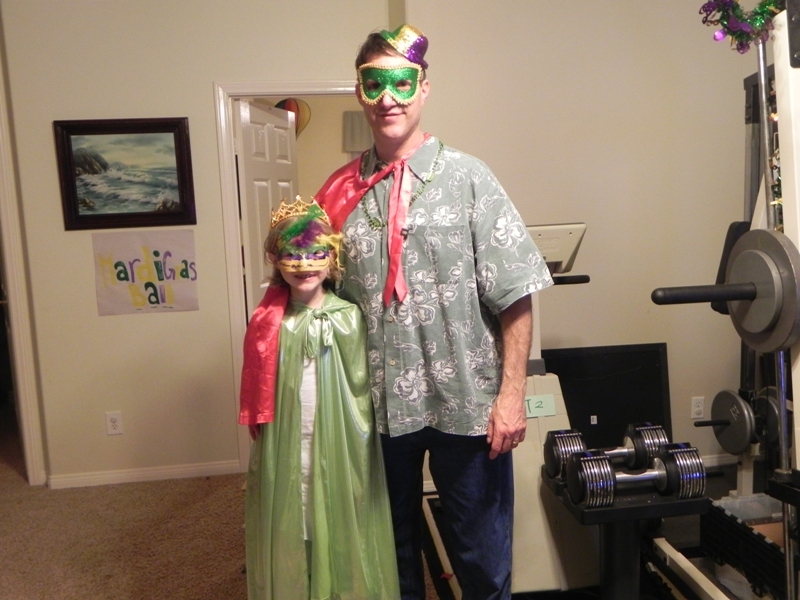 Everybody dressed up for the ball! Grandma had to improvise because we forgot to tell her to bring her ballroom best! 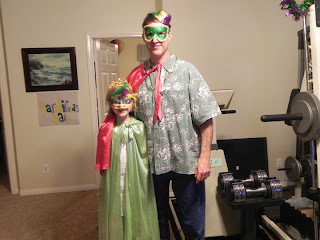 Daddy and The Ego were crowned King and Queen of the ball - had to have capes and everything! She intended for it to say "Poopy McKenna", but they haven't taught her how to spell that in kindergarten yet, so she sounded it out. I'm not sure when I'll tell her that she actually elevated her sister to Pope rather than making her Poopy! 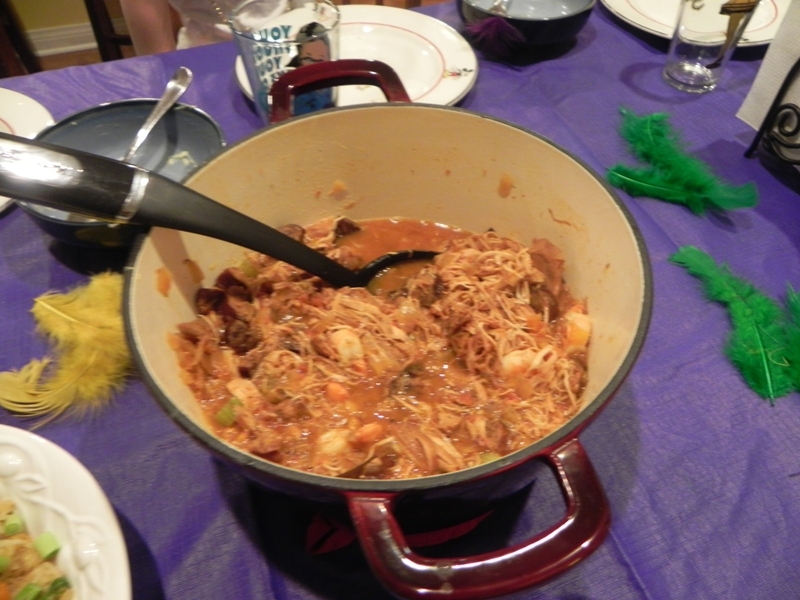 5) When you have your New Mardi Valphany celebration, make sure you have Cajun Jambalaya paired with fried rice and egg drop soup! Even the children will eat it – probably because it is so bizarre they don’t know what else to do. 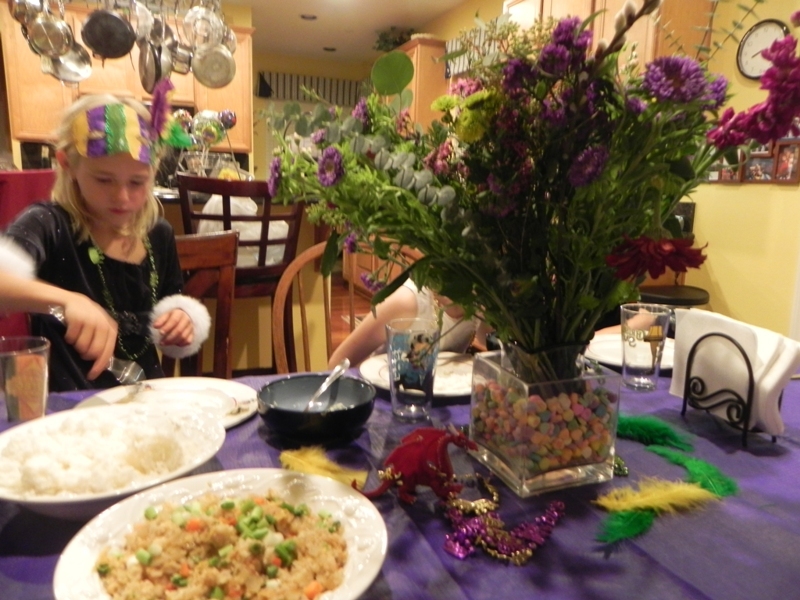 Take note of the dragon for Chinese New Year, Mardi Gras feathers and candy hearts! Jambalaya was good stuff, even over fried rice! Stay at home mom . . . vintage style! Rearranging the deck chairs on the Titanic . . .